Megen compares Christmas in cold and warm climates. Todd: So Megen, we are both teachers, English teachers in Japan, and we both come from countries that Christmas, but Christmas is so different in Japan than in our home countries, so I though we would talk about that. Megen: Yeah, absolutely. It's particularly different to Australia because we have ... we have it in summer. Todd: Oh, that's right. So it's a beautiful summer holiday, right? Megen: It is, though when it get hotter here in Japan, I start to feel that it's getting into Christmas season. Todd: Oh, right! So summer is Christmas. Todd: That's so cool. Do you still do the Christmas tree and the gifts under the tree? Megen: We do and we have a lot of the same Christmas traditions, but the food is pretty different. We eat a lot of fresh fruits, and we have like fresh prawns. I guess you might call them shrimps. Todd: Right, no we call them prawns too. Prawns or shrimp. Wow! That's interesting. You know, it's cool that you brought up food because we're both in Japan and I think it's very interesting that in Japan the Christmas dinner is fried chicken. Megen: Yeah! I can't imagine eating KFC or any kind of chicken for Christmas. Todd: Now did you know about this before you came to Japan? Megen: I didn't actually. I was shocked when I heard about it. Todd: Yeah, I didn't believe it at first, and then when I came to Japan, I saw the long lines outside KFC, and I thought, wow, this really is a thing. And now in Japan, not only do they have KFC chicken, but everywhere. So the supermarkets make fried chicken. The convenience stores have fried chicken. Other hamburger stores have fried chicken, all just for Christmas. Megen: Yeah, yes, I don't think we usually eat chicken. Maybe some families would eat roast chicken, but usually we eat cold meats. Todd: Oh, right, so Australia is fresh fruit, shrimp, and cold meats. Megen: Yeah, we have a few Australian desserts that I haven't seen in any other coutries, but I think in Australia there's a lot of variety though, so my family in particular, that's what we eat, but I think every family is different. How about in America? Todd: Ah, in America it's very close to Thanksgiving, so usually you have a big bird, so you have turkey or chicken or ham. Ham is a big one. So you might have baked ham. But you have lots of sweets, lots of cakes, Christmas cakes, pies, cookies. Things like that. So everybody gains a lot of weight. Do you eat a lot of sweets for Christmas in Australia? Megen: Well, I imagine they eat more baked goods in America, but we eat a lot of cold, like parfait, kind of desserts. With a mix of like sponge cake and jelly and cream, and we do eat cookies and different like chocolate sweets, and yeah, I think we do some baking but, yeah, not so much pies. Todd: So in Australia because it's so warm, do you spend the day at the beach? Megen: We do!Yeah, a lot of people have pools. Their own pools, so they will go swimming in their backyard, or they'll go to the beach, or play cricket outside. Todd: That's great! So do you barbecue? Is Barbecue a common way? Megen: Yeah! Especially for Christmas. It's really great to be outside. And there are barbecues you can use near the beach or in the parks, so a lot of people go outside and mingle with the locals. It's great. Todd: Oh, that's fantastic. So in the Northern Hemisphere, Christmas is often associated with snow, so you have the snowman and thinks like that. Do you have those types of decorations in Australia? Megen: We do! Although we don't have any snow, we still have the snow decoration. And usually Santa Claus still wears the long sleeve winter clothing, although we do have our own version of Santa Claus, that wears singlets and shorts. Todd: That's nice. So you've lived in a country with a warm Christmas, and a country with a cold Christmas. Which do you prefer? Megen: Well, I think because I've spend so many Christmases in Australia, that I still feel like it's Christmas when it gets warmer, and when I see things like peaches and watermelon in season I want to celebrate Christmas. 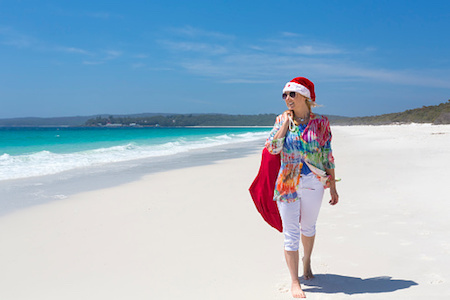 Megen: Do you want to experience a Christmas in Australia? Todd: I do. I do! That is definitely on my bucket list now, to have a warm weather Christmas. Megen: It would be so strange for you!